Simon Trudelle is Senior Product Marketing Director for NAGRA, the digital TV division of the Kudelski Group (SIX:KUD.S). In his role, he drives various market development and product marketing activities for the NAGRA Medialive Multiscreen solution and associated products. NAGRA Medialive securely enables premium TV content delivery across multiple home network devices, from hybrid and OTT set-top boxes and open devices (including PCs, tablets, smartphones) to Conditional Access Modules (CAMs), connected TVs and game consoles. Simon has more than 15 years of international software industry experience in strategic marketing, consulting, corporate marketing, product management and new product launches, working for large organizations as well as startups. He holds an MBA degree in marketing from McGill University and he is a Canadian professional engineer. 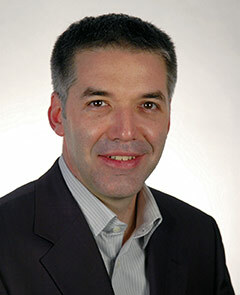 Originally from Canada, he has spent most of his career in Europe and is a seasoned industry speaker. The delivery of pay-TV content over IP networks is heating up. In the race to satisfy the consumer appetite for on-demand content and multiscreen access, a growing number of pay-TV operators are moving some of their operations onto an IP-based delivery model of OTT unicast, IPTV multicast, or a mix of both. IP delivery offers a huge range of benefits, including cost savings, increased screen reach and better customer data. IP delivery also means providers don’t have to pay for advanced PVR receivers or home media gateways to deliver content to every TV or screen in the home. And they can start to think more like the giants of Silicon Valley and personalise their services with more advanced data. However migrating even a small part of a TV distribution network onto a new system is never easy. Changing the media delivery method means examining every part of the business model–and raises a number of questions in the process. The first of these is whether to use IP-only streaming devices and smart TVs or hybrid STBs. This decision will be largely driven by business objectives and the existing technology in place. Pay-TV operators already have broadcast or IP multicast infrastructure in operation. As consumers want on-demand TV and VOD services as well as high quality linear channels, the challenge is working out which parts of the back-end and network to upgrade to IP to address these needs. The factors involved in this decision will differ by operator type. Cable operators, for instance, will need to analyse how much QAM bandwidth they have to free up for the DOCSIS technology that enables them to deliver IP content over high-speed broadband. Lower viewership channels require less bandwidth and will be able to move to IP relatively quickly, whereas high-viewership channels are likely to remain on the QAM portion of the network for longer. Cable operators also need to consider the extent to which their CMTS infrastructure will be able to meet IP video delivery demands. Finally, QAM may still be a good solution for catch-up TV and VOD services on legacy STBs. Direct-to-home (DTH) operators, meanwhile, face a trade-off between the fixed costs of the transponder capacity versus the variable cost of OTT bandwidth the average household consumes from streaming. For high-viewership channels, DTH distribution will remain more efficient for the years to come. For low-viewership channels, IP unicast delivery is a viable alternative. This is leading DTH operators to consider a hybrid approach for the domestic market. And it also brings the opportunity to go for an all-IP offer for other regions, or to launch an OTT skinny bundle to reach new consumer segments. Meanwhile, telcos–which have historically delivered their TV services over IP multicast–also have to operate a shift to deliver on-demand services, using IP unicast. The challenge is that most telcos run legacy IPTV PVR STBs that often have limited IP unicast capabilities. This forces them to renew their consumer equipment or invest in new cloud DVR platforms and upgrade their CDN networks. When it comes to actually making the shift, there are a range of strategies on offer. Often the most cost-effective approach is to integrate new network video solutions into existing legacy platforms. This creates a hybrid environment in the short term, with the long term aim of smartly evolving to next generation network video solutions. To ensure they maintain reliability, functionality and quality, all operators should outline the consumer experience, security and flexibility benchmarks they expect to meet before they accelerate their transition to a more IP-centric platform. As part of this plan, operators will need to consider a range of new customer support issues, such as managing bandwidth and network resources when many viewers are simultaneously tuned into one channel, or when delivering UHD/4K sports content to all their subscribers. IP is both a simple technology and a complex ecosystem quite different from the delivery structure familiar to most pay-TV operators. Migrating to IP not only involves evolving to a new end-to-end infrastructure but also integrating new features such as cloud DVR, addressable advertising, ABR just-in-time packaging, CDN and device management. To ensure operators make the shift without any interruptions to their service, many choose to work with third-party vendors such as pay-TV experts that understand the industry key success factors and hybrid technologies. NAGRA has the expertise to help providers achieve a more advanced “anytime, anywhere” experience and improve brand loyalty and profitability. When it comes to the future of television, all roads lead to IP-delivered TV. The biggest challenge for operators is that they are all setting off from different starting points. Different strategies are suitable for telecoms, satellite and cable operators – but there is no one solution. Rather companies should find the path to IP that works for them. But, as consumer habits continue to evolve, this is increasingly a journey worth taking.